The G Quotient identifies a management phenomenon that will change the way people view their professional roles in the workplace. 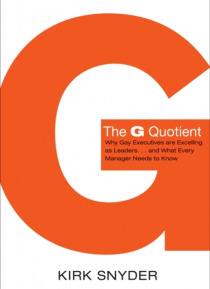 Based on a landmark five-year study, The G Quotient redefines successful leadership for all managers. Organizations and working units under the leadership of white-collar gay males are collectively experiencing 35 percent higher levels of employee engagement, job satisf… action, and workplace morale in addition to reporting greater employer loyalty and individual productivity. It is proof that today s employees are responding to a new type of organizational leader.